Credit: Flickr/SteveRhodes. Some rights reserved. From time to time stories appear in our newspapers of priests or ministers—maybe even a bishop—who have ‘lost their faith.’ Such headlines are misleading and far too simplistic. 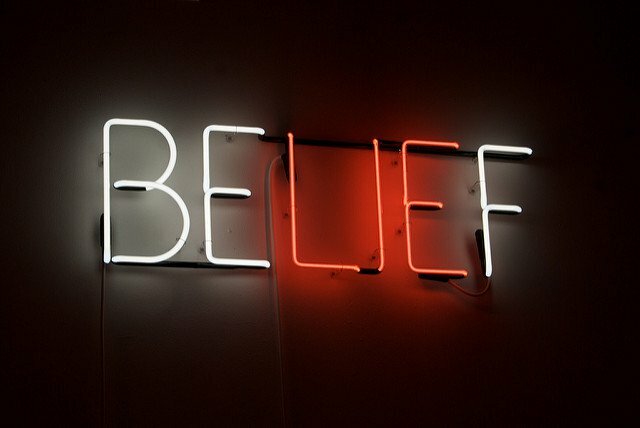 It is not faith which is lost, but beliefs: by contrast, faith is transformed. Although this process ought to continue throughout life, for a priest or minister it is most comfortably achieved after one is retired. Working clergy may regard it as their duty to defend the system, to loyally justify the church, to be sensitive to the feelings of its people, and to take care not to destroy another person’s faith. But all of these things can make us more cautious than we would like to be. That is important, because spiritual growth and development must be continuous, even if that means leaping—not lapsing—into agnosticism, recognizing that there is much of mystery in life and that we do not know all the answers. At the heart of this process we come to see Christianity—along with Judaism and Islam—more as historical religions than simply faith-based; man-made rather than divinely created. As such, they have to be judged by the evidence of history, and their scriptures scrutinized just like any other historical document. History may then indicate that all ancient religions—and maybe some modern creeds too—have arisen largely out of pre-scientific mythologies in which what is called the ‘supernatural’ lies at the center. An essential aspect of growing up demands that we reject the idea of the supernatural and recognize that the ‘natural’ is wonderful enough. Few people can deny that Christianity has often been a form of blessing to many people, and that the church has sometimes been beneficial to the improvement of human society. In the realm of the arts, in music, painting and literature, religious belief has inspired incomparable beauty and innovation; and in human behavior, incredible heroism and self-sacrifice. But there is a darker side which, in our growing, we increasingly come to see as outweighing the lighter on the scales of human judgment. Dogma has dominated reason. Superstitions have been encouraged as facts. Charity and love have been subordinated to inquisition and cruelty. Fear has governed where hope should have reigned. The wisdom and experience of half of humankind—women—has been ignored and belittled. A distorted picture has emerged and prevailed over the original teachings of the guru of Christianity: Jesus. Growing up entails re-evaluating the one who saw himself as the son of man, rather than the son of God. In the years that followed, the issue of sexuality in particular came to dominate both thought and practice. Liberation became the buzzword in theology, in personal and social relationships, in race relations and in national aspirations. And—if at times this led in destructive or uncomfortable directions for some—so be it, for we have come to realize that it is better to be united in our ignorance than divided in our certainties. That, surely, is a sign of maturity.